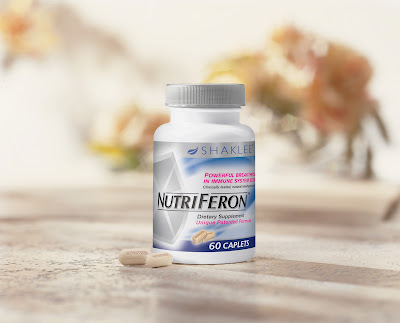 NutriFeron...what is it? Quite simply, it is a power-packed supplement that boosts your immune system. Dr. Yasuhiko Kojima, who first discovered interferon in 1954 while conducting research at Tokyo University, continued to research, testing hundreds of compounds. After 40 years, he developed a unique blend of four powerful plant extract that boosts the body's natural production of interferon - which is a critical activator of the immune system. This unique blend is NutriFeron and is available only through Shaklee. Sounds good but does is work? My answer is yes. This past fall, my oldest learned how to swallow vitamins and graduated from Shakleekids Incredivites to Vita Lea and Vita-C. I didn't have him take NutriFeron daily but when he started to show symptoms of a cold, he took one in the morning and one at night. Within three days, symptoms of the cold were no longer present. Not only was he able to remain healthy bu the rest of us did too! He also has shown symptoms of mild allergies and has been diagnosed with Exercise Induced Asthma. Just this week we decided to implement the use of Alfalfa. I'll share the results of that in another post. Stay tuned!